Riverview Cemetery's origins are intertwined with those of Huntingdon Borough. As people came to live in the region, a final resting place for those who had passed away became necessary. This area ­ a peaceful hillside on what was then the outskirts of town ­ has grown to span acres and acres of property. The narrow roadways evolved from carriage paths which carried mourners to the graves of their loved ones, or family members to the tombstones of the departed, where they would lay flowers to remember them. Some mausoleums, both ornate and modest, have been constructed by local families over the past century or so as well. Adjacent to Riverview is Holy Cross Cemetery, which traces back to the earliest Catholic residents of Huntingdon. These were the founders of Most Holy Trinity Catholic Church, a congregation that traces its history to 1787. 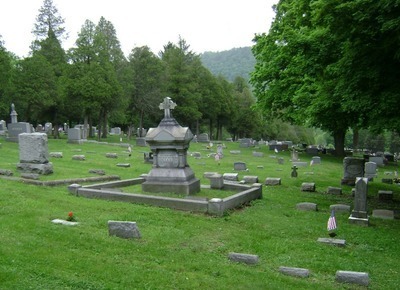 Holy Cross Cemetery was formed with property purchased Aug. 1, 1792. The grounds are dotted with traditional cedar trees, common to graveyards in both the United States and Europe. These evergreen trees stand as a symbol to everlasting life. The oldest tombstones represented here are quite simple etchings on native fieldstone, created as a mortal monument to one lost. During the 19th century, many of the grave markers were hewn from granite with ornate carvings, some rich in symbolism with a anchors representing steadfast hope, birds representing the soul, a garland representing victory over death, a lamb representing innocence or a swallow representing motherhood.